The I/O Sentinel® 4 is a robust, full-featured; Ethernet based data acquisition device with four optically-isolated status (logic) inputs and four programmable SPST relays. The I/O Sentinel® 4 was designed so all of the basic functionality you need is included to monitor and control your site equipment, including user programmable event action (macro) sequencer. Each input channel and all relays can be controlled and/or monitored over any IP network including private networks, IP-based industrial control network and the Internet. Users can operate the product using a web browser or web-enabled mobile device, while email notification may be configured to alert up to EIGHT recipients when alarms are detected. The user may also enable a sound effect to play on the monitoring PC when an alarm is generated. Logging of all user selected input status with site ID information which may be emailed from once an hour to once a day, along with hourly snap-shot functionality. We have also provided SNMP capabilities to allow multiple units to be monitored with any SMNP manager software package. SMTP username and passwords are also supported. The I/O Sentinel® 4 is equipped with four optically isolated status/logic inputs that may be configured for 5 to 24 volts DC wet or dry (contact closures) status/logic monitoring. The four one-amp relays may be configured for either normally open or normally closed dry contacts. Each relay may also be configured for ON, OFF, pulsed or reboot operation. The I/O Sentinel® 4 may be paired with a second I/O Sentinel® 4 to form a “4 Channel Bi-directional Status/Relay Extension Cord”. • Logging of all user selected input status with site ID information which may be emailed from once an hour to once a day, along with hourly snap-shot functionality. • Plug-in euro-block screw terminals for status and relay connections. • Nine front panel I/O activity LED indicators. 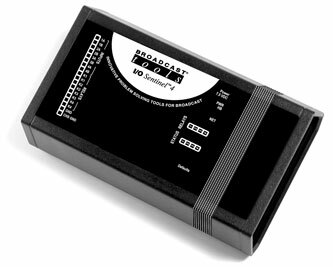 • Rear panel RJ-45, 10/100base-T LAN/Ethernet interface. • Surge protected power supply. Domestic supply provided. • Four units may be mounted on one RA-1 1-RU shelf. • Web-enabled back-up transmitter ON/OFF control system. • One end of a full-duplex four channel web-enabled I/O extension cord. • Relay control and status monitoring via a web browser and/or user defined PC application.